"It has taken 2½ years to complete this book, and I hope that you will be as pleased as I am to finally see it published. My hope is that it will help women to go deeper into their authentic femininity, to further their understanding of the Womb Blessing and the life path it offers us, and to enhance and quicken the healing and awakening they receive." Do you desire to live fully as the passionate, spiritual, empowered, loving, creative and sensual woman, you know you truly are? Five times a year, thousands of women worldwide connect with each other. 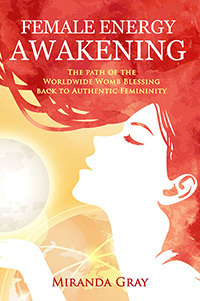 They connect to walk a path of female healing and a return to their long-forgotten authentic femininity through the Worldwide Womb Blessing - a Female Energy Awakening. Why the womb energy centre is critical to the well-being and happiness of all women, whatever their age or physical condition. How the Sacred Feminine is relevant to modern women, and how reconnecting to this principle can lead you to a less stressful life. How to fully embrace your femininity in a masculine-centred world that constantly disconnects women from what it means to be truly female. 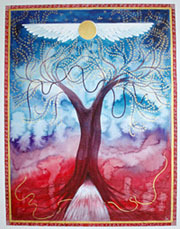 The book is full of ‘Aha!’ moments, meditations and exercises for all women - whether or not you have a womb or a cycle. 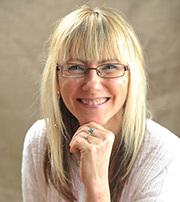 Miranda Gray has undertaken a lifelong exploration of the effects of the menstrual cycle on women’s perceptions, feelings, needs, creativity, sexuality and spirituality. Her book Red Moon explores women’s spirituality, while The Optimized Woman shows us how to apply the gifts of the menstrual cycle – days of optimised skills – to everyday life. Her work has helped many women to understand themselves, see their cycle as a positive experience, live in harmony with their cycle and meet its needs, and to build understanding with partners and family.